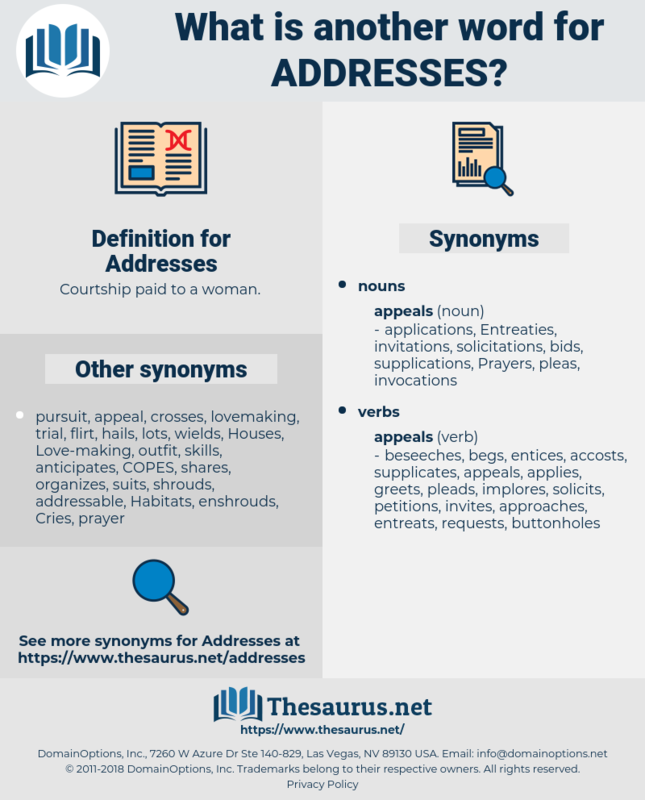 What is another word for Addresses? Courtship paid to a woman. Answered, speaks, destination, remarks, workplace, treasury, Trafficking, anti-trafficking, traffic, regulatory, recipient, recipients, consignee, talking, headlines, talks, shall, conforms, discusses, audience, justice, assumes, trading, thb, adress, tip, ZHI, speech, speeches, respond, tackles, treat, treats, adresse, directorate, directorates. communications, deals, administrations, consider, numbers, relates, residences, papers, expresses, speakers, representations, pertains, destinations, refers, Remedies, headquarters, responses, corresponds, details, Households, headers, names, considers, coordinates, troubleshoots, satisfies, recognizes, seats, letters, report, reports, coordinated, target, targets, determines, assesses, solves, counters, analyzes, encompasses, treatment, reflects, briefings, settlements, Co-ordinates, Emails, Areas, quarters, handling, endeavours, headings, dealings, particulars, internet, gates, constitutes, Bears, facilitates, directs, heads, Beneficiaries, references, locations, Testimonies, applies, parts, Referrals, pronouncements, services, covers, interventions, charts, receivers, drafts, processes, rooms, definitive, Pleadings, consignees, traffickers, fixes, processing, governs, handle, notes, objectives, rule, rules, accords, procedures, Relatives, grid, looks, contributions, flats, offers, Ceremonies, managers, Permits, provides, Houses, sides, reporting, comments, enables, manages, dwellings, domicile, Domiciles, mailings, tables, postal, minds, Bureaus, doors, appeals, spans, guides, topics, Languages, announcements, reviews, fulfils, Guidelines, auspices, homes, scans, elements, returns, skills, approaches, Drives, markings, complies, ip, aims, arguments, aligns, audiences, allows, avenues, data, networks, Persons, Friends, tents, themes, submissions, venues, spots, Analyses, touches, sections, fronts, is, attacks, beings, actions, calls, plans, Feet, offices, victims, signs, ft, Bodies, types, attempts, place, places, tries, books, units, remarks, Trafficking, LINEs, recipients, talking, headlines, talks, discusses, responds, speech, speeches, treats, directorates. administers, demonstrates, describes, adds, adheres, solving, investigates, Considering, suppress, concentrates, understands, decrease, decreases, regarding, regards, advises, transcends, encompass, illustrates, reads, forwards, summarizes, removes, caters, Relating, adjudicates, eliminates, Orientations, reacts, encapsulates, confronts, overcomes, reiterates, designates, stresses, evaluates, exists, represents, explains, Measures, articulates, description, raises, adjust, adjusts, testifies, reinstates, correspond, acknowledges, asserts, Treaties, sends, presents, reduce, reduced, reducing, serves, explores, adverts, surpasses, descriptions, incorporates, rectifies, parses, arises, leads, regulates, 's, emphasizes, underscores, attends, integrates, advocates, scrutinizes, stops, oversees, replicates, see, sees, emphasises, encourages, recognises, reply, transmits, repeats, communicates, undertakes, ensures, proposes, intervenes, indicates, empowers, negotiates, deals, nears, observes, intercepts, reveals, resists, alludes, pursues, annotations, interacts, distinguishes, disposes, recovers, enumerates, resembles, symbolizes, portrays, transacts, heeds, face, adopts, contemplates, anticipates, documents, wears, mentions, engages, embraces, reproduces, traces, prevent, prevents, supervises, envisions, suitable, clarify, clarifies, gathers, foresees, appears, performs, reminds, canvasses, teaches, defines, fosters, operates, coincides, reference, hears, cares, devotes, relates, Recalls, passes, challenges, expands, presupposes, estimates, specify, specifies, Combating, combats, uses, examination, recommends, embodies, resorts, pays, highlights, stems, registers, arranges, directed, displays, Focuses, focusses, rebuffs, mandates, poses, bridge, formulates, proceeds, contributes, alerts, expresses, crosses, prescribes, assists, note, screens, elaborates, helps, conveys, exposes, predicts, earns, reaches, contains, fulfills, respect, respects, works, arrives, comprises, Versus, strives, questions, accuses, retains, safety, attests, envisages, forecasts, feeds, warns, calculates, balances, includes, underlines, promotes, concludes, deploys, agrees, Establishing, establishes, study, Studies, persists, creates, stipulate, stipulates, security, depicts, resumes, argues, seeks, visa, VISAS, submits, chairs, contends, equals, Les, causes, fills, introduces, says, expounds, suits, suffers, authorizes, Carries, encounters, follows, sets, suggests, centers, corresponds, ranges, produces, favours, denotes, review, reviewing, broaches, draws, decides, captures, outlines, belongs, listens, involves, cites, receives, considers, ranks, requires, occurs, monitors, entails, Aiming, Deems, coordinates, completes, interferes, troubleshoots, satisfies, employs, recognizes, overlies, installs, calms, complements, invokes, features, Strikes, relies, exceeds, lists, reports, consults, evokes, quotes, centres, concurs, imposes, tells, opens, Affects, Gives, target, targets, determines, Exercises, experiences, Comes, tends, enters, assesses, notice, conjures, begins, bends, solves, Rests, Tracks, Surveys, afflicts, fighting, fights, turns, eats, Occupying, occupies, varies, analyzes, qualifies, conducts, encompasses, green, reflects, asks, marks, moves, hosts, pond, lies, lays, preys, owns, finds, lower, analysis, appoints, maintains, Has, notifies, touch, touching, consists, Upon, connotes, collects, fits, endeavours, continues, recounts, view, viewing, views, falls, mirrors, becomes, Lives, intends, supplies, matches, constitutes, holds, purports, Bears, facilitates, closing, closes, directs, attaches, ties, combines, points, heads, develops, IMPACTS, echoes, account, accounts, modifies, references, brings, Plays, meeting, plugs, hugs, applies, implies, vouches, covers, lifts, wishes, hopes, processes, hits, flows, fixes, processing, builds, governs, runs, walks, feels, notes, rule, rules, means, discussions, expects, pits, keeps, looks, acts, launches, offers, Permits, lacks, provides, enables, manages, believes, goes, shows, likes, spans, guides, reviews, fulfils, Guidelines, controls, scans, returns, approaches, Drives, complies, begs, puts, aims, lets, allows, Does, form, Forms, counts, thinks, wants, Analyses, touches, gets, is, attacks, calls, plans, cuts, offices, attempts, places, tries, remarks, Trafficking, cover, talks, conforms, discusses, assumes, responds, speech, speeches, respond, tackles, treats, directorate, directorates, question. tackle, tackling, constitute, deal, handle, discuss, Trafficking, cover, approach, relate, treat, involve, seek, question, aim. premises, resolves, leaderships, declarations, implements, solutions, WEBSITES, discussions, concerns, engagements, divisions, directors. 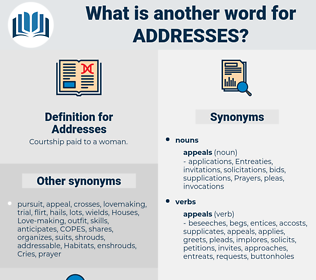 resolving, accommodates, delivers, examine, Examining, settles, Correcting, corrects, resolves, identify, identifies, pertains, concerning, refers, achieves, implements, concerns, speaks. There being no prospect of further wars the army was greatly reduced, and Jack was retired on half pay, and as soon as matters were arranged in London he again made his way down to Southampton, and at once asked Mr. Anthony's permission to pay his addresses to his daughter. Loyal addresses had begun to pour in, but there was one whose words still ring with a certain martial loyalty, and which Elgin answered with genuine emotion.